Lucky doesn't begin to describe how I feel right now. After 30 years it finally happened. 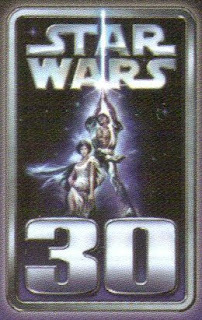 As an artist and a HUGE Star Wars fan it couldn't have been a nicer time to have been invited to participate in an artistic event for Topps' 30th Anniversary of Star Wars collector's card series coming out around mid-June. I will be drawing 76 sketch cards for the upcoming set. Samples of which, once approved by Lucasfilm, will be posted here (links) for your perusal. I just received my cards within the last 30 minutes so it will take a little time to get the ball rolling, the scans made, the approvals had and then back here. If any of you have any questions feel free to ask me and I will answer to the best of my abilities. Since I am also working on two other card sets and am still slowly updating Nerf-Herders-Anonymous.net right now please forgive any delays that might be had in replying. In the meantime I hope everyone enjoys all the celebrations (official and not) of this wonderful year and for those of you attending CIV and CE I will see you there! !